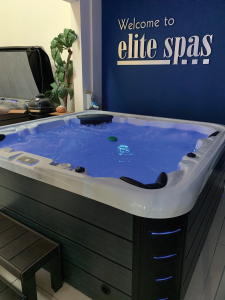 Approaching the completion of its second decade in the spa and hot tub sector, Elite Spas has sprung a huge surprise on the industry with the launch of a Chinese-sourced range of spa to run alongside its existing American stock offering. The Far East Swim Spa range, promises high quality specifications at a retail price of £9995 to £18,995 for a full turbine swim spa. The team also now offer a range retailed between £4,195 and £4,995 for a two pump, 50 jet spa of unbelievable quality, which, they say, they have found more competitive than some of its European and Chinese competitors. Elite retailers were introduced to the new range at a recent dealer day, held in the West Country, with clear sales messages and strategies in place. “As the UK market progresses, we have found it necessary to review our business model as the quality and quantity of Chinese product has increased,” reveals Elite’s Kev Sanger. “We find the biggest success tends to come from retailers solely taking on the Elite brand. However most retailers are now dual brand and the market place certainly has opened up for the end customer. A husband and wife team, Kevin revealed that he and managing director Isobel Sanger, began talking to a Chinese spa manufacturer as early as 2018.